• New U.S. American Buffalo Indian Tribute. This CHINESE NEW YEAR 2019 – YEAR OF THE PIG COIN is lucky money and a treasured collectible. 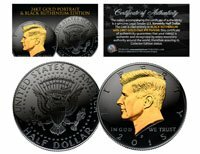 This high-quality tribute coin has been layered in Genuine 24 Karat Gold, and then enhanced with beautiful colorized images using a unique painstaking multicolor authentic process.